The Orchard is set in the countryside of St Kew Parish above the valley of the River Allen, just inland from the coast at Port Isaac (5 miles via the lanes, about 3 as the crow flies). The farmstead, the only property on the lane, is a few minutes walk from St Kew Highway with its local shops and pub. There are miles of lanes and rural footpaths to explore. The A39 Atlantic Highway is easily accessible, making this the perfect base for exploring all Cornwall has to offer. Imagine a Cornish orchard; apple, pear and plum trees, hedges laden with damsons and sloes, shaded by hazel and oak. Herbs grow in a corner. Now imagine it all to yourselves; no other campers to vie for the hammock or the hot tub, as peaceful as you choose to make it. 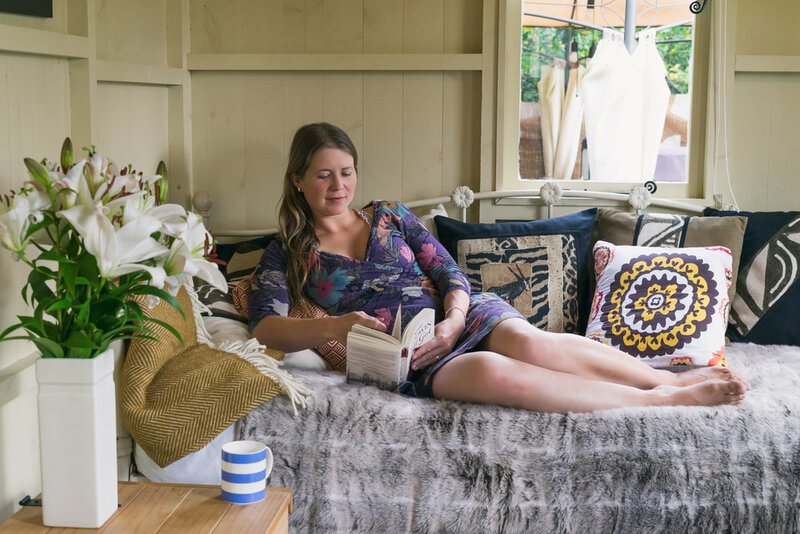 In The Orchard we have two Shepherd huts waiting for you, the Master Shepherd hut is sited on a decked area with an adjacent sheltered alfresco dining area. Measuring 5.5 metres (18 feet) in length, it is a very generous size and is able to accommodate a luxurious King size bed, a small wood burning stove to keep you snug and a comfortable day bed, designed to be a comfortable sofa or two full size single beds dependant on your needs. The Junior Shepherd hut is specifically designed for children; it has bunk beds and comfortable bean bags to give your children a real taste of the simple life in the country whilst being close enough to keep an eye on! Across the orchard is a (very private) hot mains pressure outdoor shower available at the turn of a tap. If you haven’t experienced showering under African skies on safari, now is your chance in Cornwall. We provide a set of towels for every guest, for use on-site, not for the beach please. Within the Orchard is a wooden hot tub. Whether your day has been strenuous or lazy, soak the stresses away. For a special experience, try the tub under the stars. The colder the evening air, the better the experience. Trust us, when you are hot from the tub, you won't feel the evening cold, even when you get out. A tub takes upkeep and requires care; it is not to everyone's taste, and so is not included in the basic rental, but is available if pre-booked as the only 'extra', with a one-off fee to cover the cost of set-up.